WHAT IS THE FOOTBALL FRENZY FUNDRAISER? 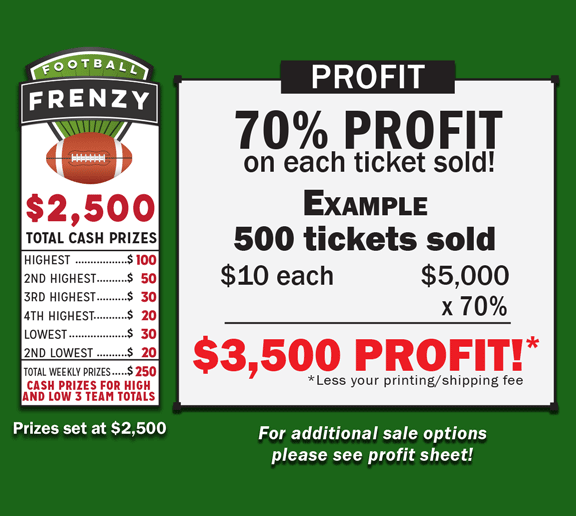 Football Frenzy is a ticket selling fundraising program designed to make your organization money. 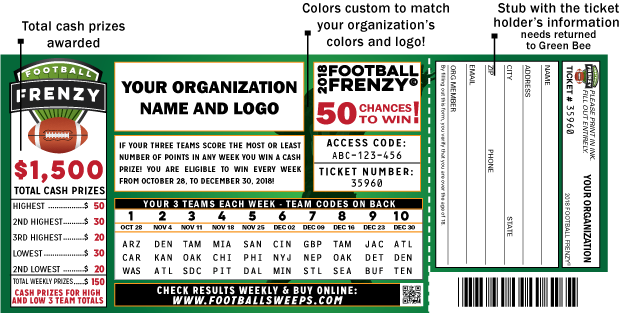 Your fundraising package includes Football Frenzy tickets printed with 3 NFL or College football teams each week for the last 5, 8, 10 or 17 weeks of the football season. The 3 teams change every week on the tickets and no two tickets have the same 3 teams on any given week. Your members sell tickets for either $10 or $20. CASH PRIZES are awarded to ticket holders who have the Highest and Lowest 3-Team Combination scores each week. For example, if Arizona, Carolina and Washington score the most points one week, the ticket holder with these 3 teams will win a cash prize. Green Bee furnishes you with all the tickets, scores, results and winner’s lists weekly. The Football Frenzy Fundraiser is available in two program options. 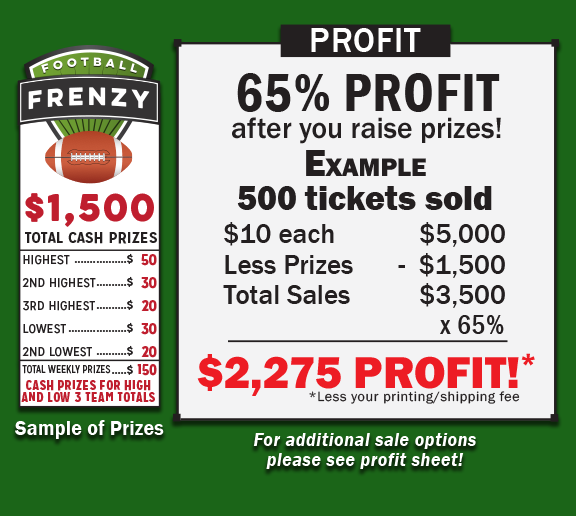 With both programs, your organization will profit from selling the Football Frenzy Fundraiser! Order 500 to 5,000 tickets custom printed for your organization. Sell tickets for $10 each and you make $6.50 per sale after you pay your prizes. Sell tickets for $20 each and you make $13.00 per sale after you pay your prizes. • Choose your prizes! Customized for your group! • Choose your weeks! Can be 5, 8, 10 or all 17 weeks! • Buy Two Get One Free! This is an option. Ticket holders can redeem a FREE third ticket online. Minimum order is 500 tickets. Your organization pays for printing and shipping. Have an ad or coupon on your tickets from a local sponsor who’ll pay your printing cost! When finished selling, you remit $3.50 per ticket (for $10 tickets) or $7.00 per ticket (for $20 tickets), after your prizes are reached. Order 500 to 5,000 tickets custom printed for your organization. Your organization is included in a co-op with other organizations. This enables you to make money starting with your first ticket sold. You are NOT responsible for the prize money. Green Bee pays the prizes. You may or may not have winners from your organization. However, you make money starting with your first sale! Sell tickets for $10 and you make $6.50 per sale. Sell tickets for $20 and you make $13.00 per sale. • Profit from your first sale! • Co-op program where you are grouped with other organizations. Minimum order is 200 tickets. Your organization pays for printing and shipping. Have an ad or coupon on your tickets from a local sponsor who’ll pay your printing cost! When finished selling, you remit $3.00 per ticket sold. Unsold tickets need returned to Green Bee or *option is to purchase all tickets. HOW DOES THE FOOTBALL FRENZY FUNDRAISER WORK? Ready to get started? Order Here!